Homes and businesses that don’t have access to city water tend to get their water from a private well. This is great as it allows a property owner to have their own water for their family and employees. Because its the only access to water that they have, it is so important to get water well service in order to keep it in the best condition. At All About Plumbing & Septic, we are here to offer a wide range of well water service in Mills River, Hendersonville, and Asheville, NC. Whether you need water well repair or water well pump installation, we are the professionals that you can count on. We have been in this business for several years and have the skills and knowledge to provide you with services to ensure your well is in tip-top shape. Whatever service you need for your well, we are happy to help! To learn more or to set up an appointment, please call us at 828-778-2425 to speak with one of our technicians. We Provide Water Treatment Services To Ensure Your Well Water is Safe and Clean. A well water service that we think is extremely important to the safety of your well is water treatment service. Because well water doesn’t go through a municipal water plant, it doesn’t get the necessary filtration that it needs. Since we get well water directly from the ground, the water can be contaminated with farm chemicals, metals, minerals, salts, as well as bacteria and pathogens. The good thing is that while it doesn’t go through a municipal water plant to get clean, there are ways to provide it with the necessary water treatment that it needs. With the help of our technicians, we are able to tackle well waters biggest issues by installing whole house water filtration systems. Water filtration systems are great as they can remove contaminants from your well water and leave you with water that smells and tastes great, as well as being safe. 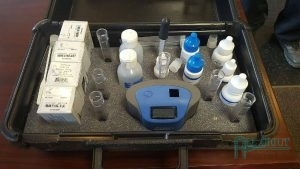 We are able to test your well water on site and see what specific water treatment you need for your well water. 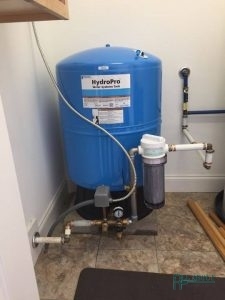 If you have hard water, we also offer water softeners in order to avoid dry skin and hair, water spots, and build up of sediments in our plumbing systems. If you want to learn more about water filtration for your well water, call us today! We are able to give you more information about this type of water well service in Mills River, Hendersonville, and Asheville, NC. For Well Water Tank Repair, Replacement, and Installation Give Us a Call! Because we use our well in order to drinking water, as well as a means to clean, bathe, and cook, it is so important that the actual well water tank is in great condition. While the well water pump is used to pump the water into your home or business, the well water tank is used to control the pressure. Inside of the well water tank is two bladders–the upper bladder that holds air and the lower bladder that holds water. When the water comes in the tank through the lower bladder, it pushes on the upper bladder. As the air pressure builds, these systems work together to pressurize the tank. Once the tank has certain pressure, the tank cuts off the water until someone turns on the faucet; when the pressure gets to a certain level, the well water pump will pump more water into the tank and the whole process starts over again. There are a couple of ways that a well water tank can become defective–the tank is leaking, the upper bladder ruptures or the tank is waterlogged. If you are experiencing any of these issues, you will need water well tank repair. Your water pressure becomes too low and then too high. The water pump constantly runs. The water pump turns off and on for no reason. The water pump doesn’t run long enough to pressurize the tank. Signs of corrosion on the tank. Water leaks at the base of the tank. If you think you need repairs, our technicians can help! We are able to provide repair service, as well as well water tank replacement and installation if you are wanting to upgrade to a new tank. 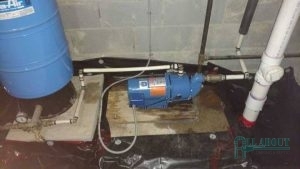 We can also install water well booster pumps if your only issue is having low water pressure. If you have any questions about this type of water well service in Mills River, Hendersonville, and Asheville, NC, give us a call at 828-778-2425 for more information. We will get your well water tank back in great shape. If You Need Well Water Pump Repair, Replacement, or Installation, We Can Help You! The purpose of the well water pump is to pump water into the tank, that then pressurizes it and releases the water when a tap is turned on. Without a well water pump, a home or business is unable to get water to wash, cook, clean, bathe, or drink water. If you think that our well water pump is on the fritz, but are still unsure, here are some signs that you need to call a technician for well water pump repair. When you turn on the tap, no water comes out. The water pump turns off a little too quickly. Infrequent sprays come from the faucet. You are experiencing low water pressure. Your water pressure is high and then low. There are weird noises coming from the tank. The water pump will turn off and on rapidly. If you have noticed these problems with your well water pump, then you need to call the professionals at All About Plumbing & Septic. We are able to repair the well water pump to get it back in great shape. 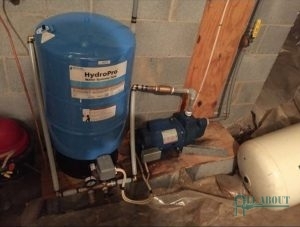 There will be times when your electric bills are too high or your water is dirty, which are signs that you need a well water pump replacement. We not only repair well water pumps, we can also replace them. Another thing we are able to do is to provide installation service. Our technicians are able to install centrifugal pumps, deep pumps, jet pumps, shallow pumps, and submersible pumps. If you want to schedule an appointment for this type of water well service in Mills River, Hendersonville, and Asheville, NC, call our technicians at 828-778-2425. We can inspect your well and determine if the issue is with the well water pump or with the tank. Whatever the issue is, we are able to repair it or replace it if it’s damaged beyond repair. Don’t wait! Get in touch with us to book your appointment today. Updated on January 22, 2019 at 12:22 pm by All About Plumbing.